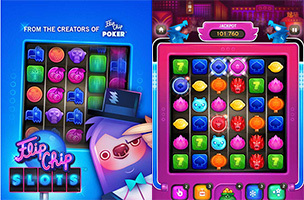 Flip Chip Poker developer Sava Transmedia has announced the release of Flip Chip Slots on iOS and Android devices. The game combines slot machines with a match-three game, and challenges players to earn as many coins as they can to win the jackpot. Flip Chip Slots offers multiple casinos, each with their own set of missions to complete. Players spend coins to spin the wheels, and then receive a limited number of moves to manipulate the symbols on the reels to earn additional coins. Each symbol is worth a different amount of coins when cleared, and special matches (like those in a “T” or “L” shape) result in power-ups on the board. These boosts can clear large sections of chips from the board, and help players fill the jackpot bars on the side of each machine. When filled, players receive thousands of coins to put back into the machines, continuing the game’s cycle. Players can also use or purchase power-ups to increase their coin counts. These include extra moves and boxes of TNT, among others. Rounding out the experience, players can connect to Facebook to compare their progress with friends, and can unlock achievements as they play. The game also offers free daily spins to reward player loyalty. Flip Chip Slots is available to download for free on iOS and Google Play. Check back soon to follow the game on AppData, our tracking platform for mobile and social apps and developers.